In addition to whole schemes, Peter Bell Architects has over the years designed a number of architectural elements. Working with many superb fabricators, some of these have been produced again for other clients. Please contact us if you have a particular problem for which you need a bespoke item conceived. stone staircase suspended in it. These wire lights were designed as a minimal and flexible lighting solution. 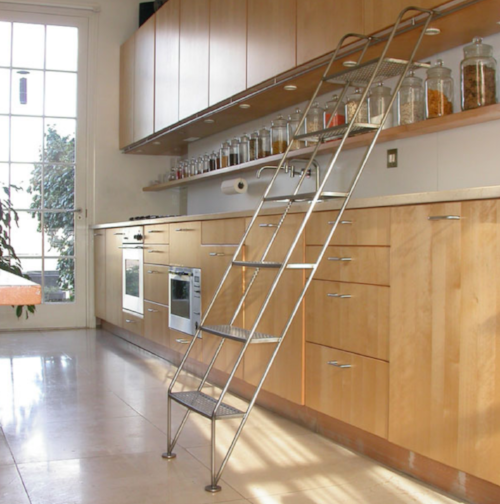 This stainless steel ladder on a sliding rail enables easy access to the top shelves and space above. Its delicate structure fits into the scheme whilst providing sufficient strength to enable the user to feel secure. This stainless steel balustrade support was an elegant solution to supporting the glass balustrade at west end hairdressing salon.